Stray Dog Light for Sale! 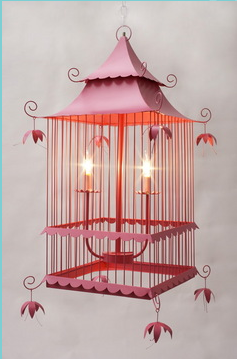 Adorable, brand new Stray Dog Designs Birdcage light fixture for sale from a recent project in which it did not work size wise. Retails for $625, this one available for $350! I recently spec'd that lantern for a showhouse design that I submitted! I wish I got the space (unfortunately it went to someone else *sigh*) because I would snag it from you in a heartbeat (what a great deal)! Check out my last blog entry to see some great ZEBRA ottomans (and more) from Sebastian Carpenter Designs. OMG! I love this light! OMG – i love this light! email me the measurements, por favor? This light is SO adorable. I thought I recognized this business from when I lived in Seattle. Great, great designs! i grabbed a hot pink paper mache bull head by Stray Dog at a trade show recently. Looks so great on my wall. I love their stuff, and they're a green company! I just found your site, keep up the interesting articles!